It's the message log! A lot of useful information is stored in this panel that pops up at the start of each turn. It's worth reading through it and looking over what has happened for your turn. It tends to get very long as the game goes on. In this case though there are two, maybe three, important messages in this bunch. The first being that my god has awoken. 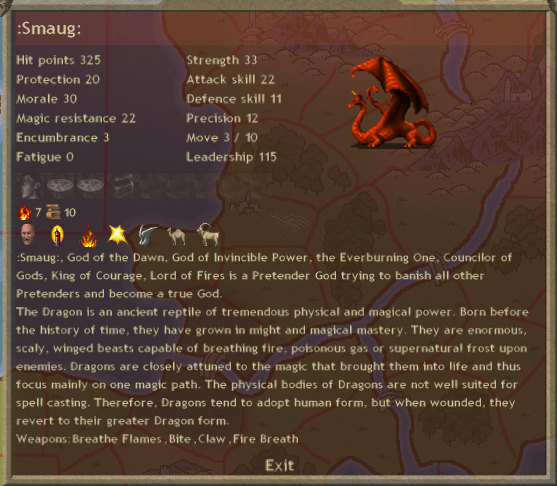 Yay :Smaug:! The second being a hero has arrived. Yay Mictipoctli! (I will never remember your name) The other possible important piece is that the players with sleeping gods are starting to wake up now. It doesn't mean everyone's god came back this turn, there is some variability, but if they're not back by now they will be soon. The battle report is important too, but it was just me expanding into some independents again, I took very few losses. Here is :Smaug: in his human form. He takes the shape of a great sage and is not very impressive! However, in dragon form he is quite scary. He is capable of taking on most things right now. However, he doesn't have many gear slots, so his viability as an SC and raider is somewhat short lived. 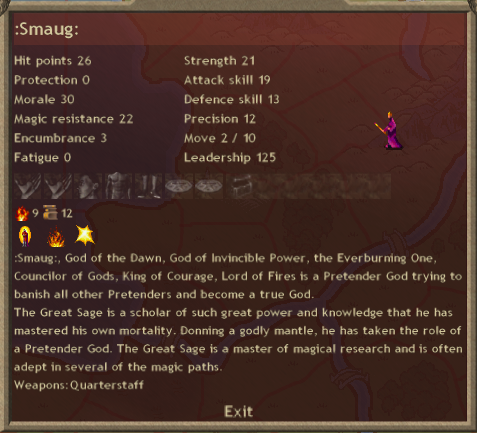 By mid game he is quite vulnerable to things with gear or mage squads. And this is the hero I got. 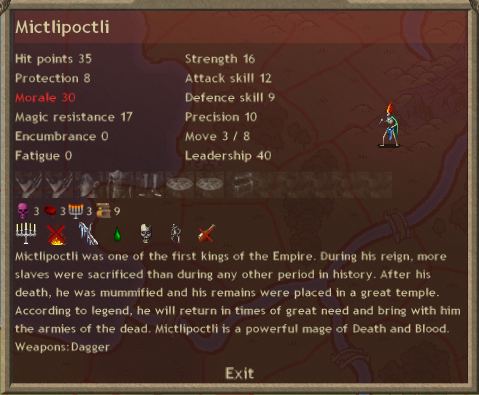 Mictlan doesn't innately have death magic, so getting a hero with D3 is quite nice. It means I can forge all of the death boosters if need be, and I can easily cast the blood summons that require death as a secondary path (primarily vampires). I am officially out of expansion room. It's time to go to war with someone. However, this is also the turn that I took late and did not have time to do any diplomacy. Since Pan has an army (I know it's an expansion force, but I don't know if hes out of expansion room and will attack), I go send some reinforcements down to the swamp province in case he attacks. Ooooooh, I found a magic site in that swamp! Let's go check it out. This is the reason why. They're B2D2, which breaks you into two of the vanilla end game paths, which would be a huge deal in a game without EDM/AE. Additionally they only cost 100 gold, which means they have very little upkeep or cost relative to most mages. This is especially good for me, because research is a problem for Mictlan, and a 6 research (7 with my magic scales) mage for 100 gold is a great help. 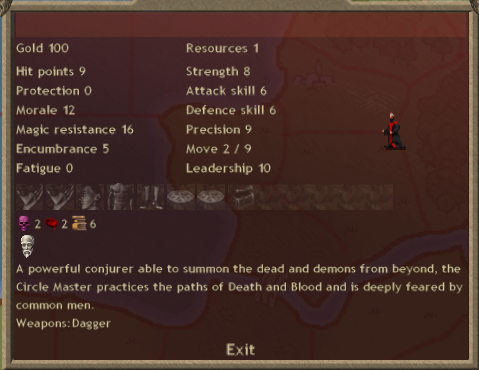 I can also use these guys as blood hunters if I don't want to use my capital only mages. This is cause for concern. Arco owned that province last turn, and now there is a fairly significant sized army in there. I expect he is planning to invade me, as everyone must be running out of expansion room fairly soon now. 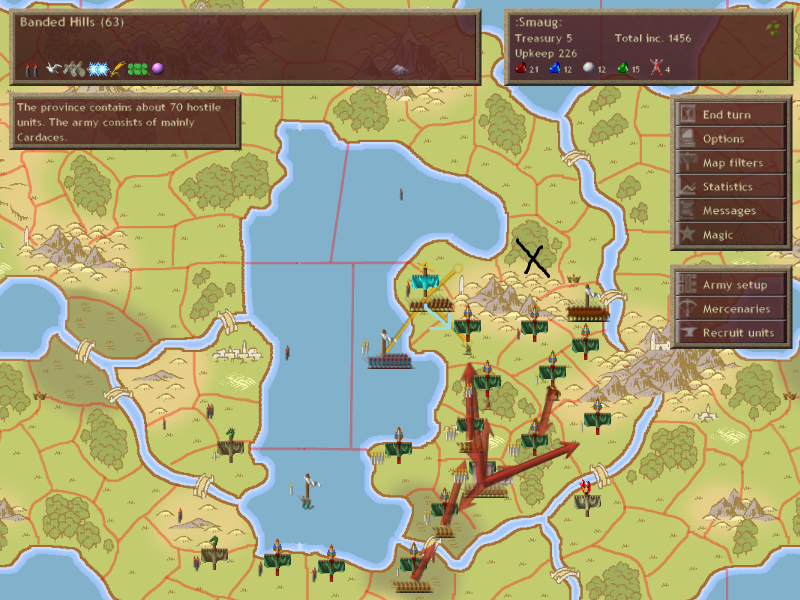 I move a number of units along with my god up to the border in a defensive movement trap. I also expect him to take that independent province to the east and attempt to attack me from there. 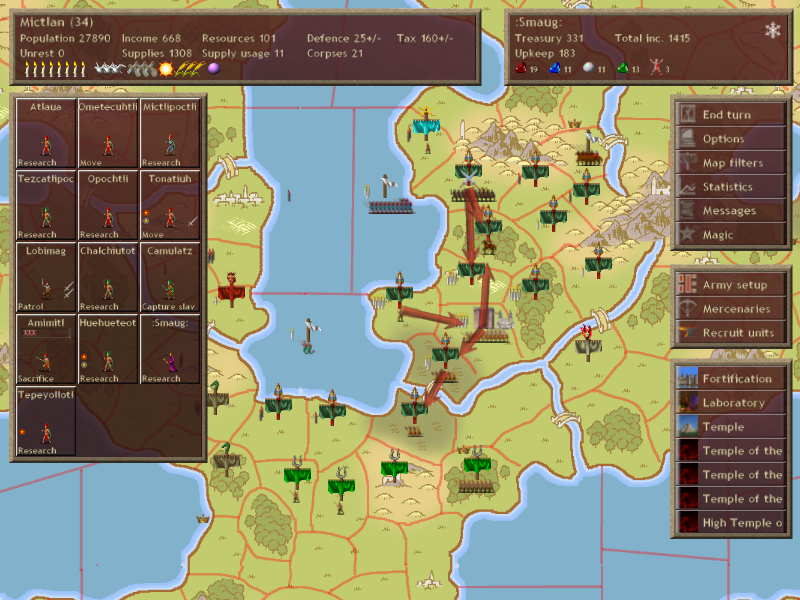 In addition to moving some allied forces to the province, I hire a group of mercenaries to help me defend it. 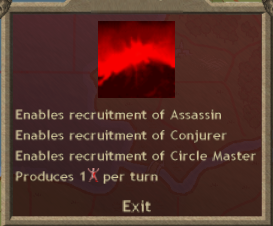 Unfortunately, I forgot that mercenaries come nearly at the end of the Turn resolution order and they wont be able to join me in the defense this turn. However, if I win the battle I can use them on the offensive next turn. If I lose the province then money is refunded as a failed bid. Additionally, I have talked to Irony or Death this turn. Dexanth always finds other people to fight his wars with or for him. If he hasn't talked to you about jumping in on an invasion, there is a high possibility he is planning on invading you. Therefore, I reach out to IoD hoping Dexanth hasn't gotten him first, and find that he hasn't. IoD and I work out a tentative cooperation to invade him, a neither of us have been talked to by Dexanth, and we have the same concerns.